Every bowler has a unique bowling action, a lot of which depends on their body type and their bowling style. There two main types of bowlers - spin and seam and both can bowl left or right-handed. Seamers are generally the faster bowlers with longer run-ups while spinners usually only have a few paces before they deliver the ball at a slow pace. Both types of bowlers will use different grips on the ball, more of which is explained in the seam and spin bowling section. Finding the right action depends on how comfortable you feel when you bowl. Most bowling actions are side on, which means the shoulders are square to the batsman. 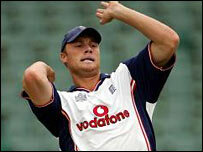 This is the position which most coaches will encourage bowlers to release the ball from. The side on action will also encourage away swing more than a front on action. 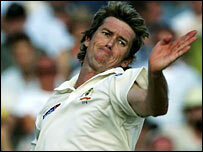 Examples of the side-on action include England bowler Matthew Hoggard, Australia's Brett Lee and Glenn McGrath. Rather than bowling side on, the bowler tends to have an open chest. This does not mean the front on action is wrong, it should be encouraged if some bowlers prefer bowling in this fashion. 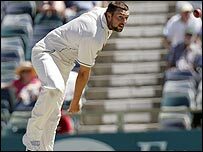 England fast bowlers Steve Harmison and Andrew Flintoff have open-chested actions, along with South Africa's Makhaya Ntini. The chances of picking up injuries are greatly increased if a bowler has an action that puts too much pressure on their body. A mixed action is a combination of both the side on and front on action, which puts unneccessary stress on the spine. It's important to get your bowling action checked out by a coach to ensure it is either side on or front on, rather than a bit of both. "Keep the hips and shoulders in line and you'll be fine - twist the back and it will crack!"